Will's Korean Journey: A Korean Wedding. 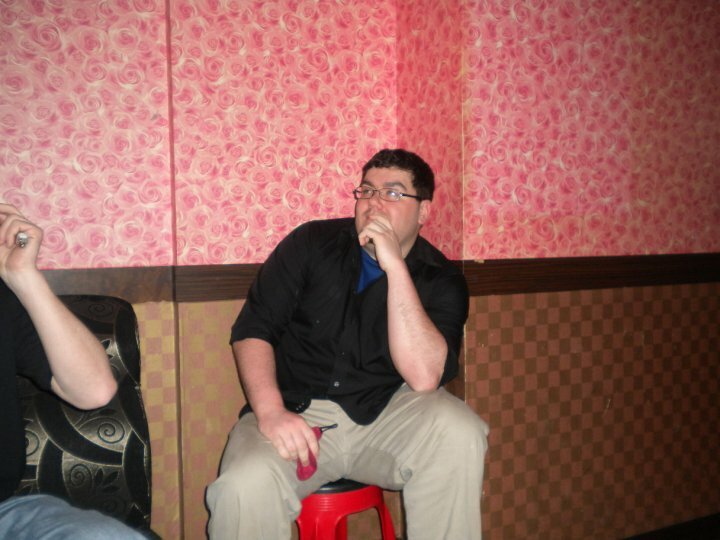 A blog about my Korean misadventures from start to finish. When you stop to think about different cultures, it really is interesting how transcendent some things are. I think some of it has to do with the introduction of American media into foreign markets. 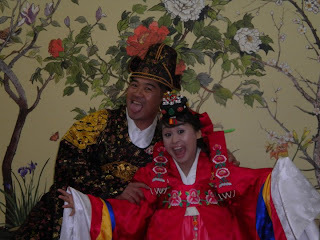 Korean weddings, are a wonderful/interesting/weird mash up of western wedding tradition, and Korean traditionalism. 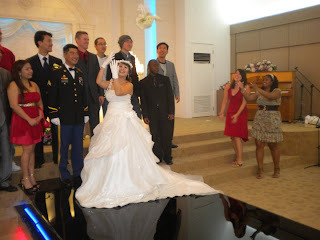 What I am curious about however is when the transition from the more traditional Korean wedding, which I have still yet to witness, to the current western oriented ceremony has taken place. For starters let's talk about the things which the two ceremonies have in common. The initial ceremony is overseen by a minister, who says all the normal things you expect to hear at a wedding. Granted he says it in Korean unless you are lucky enough to have one who speaks English and has an English speaker as a participant in the wedding. 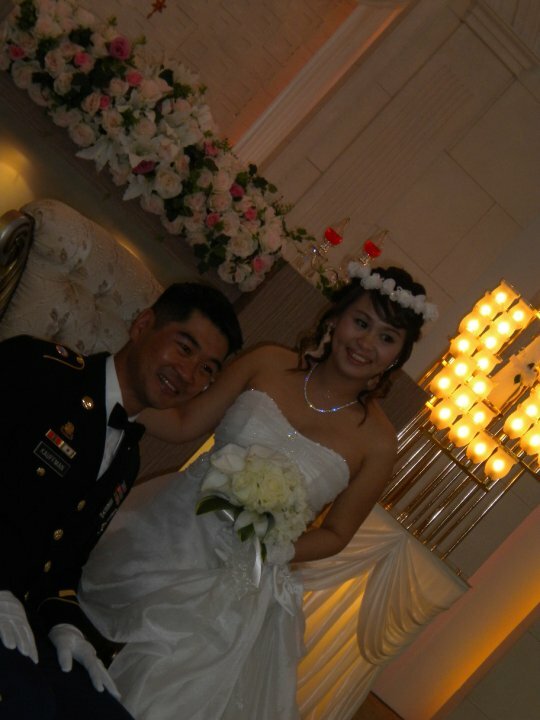 The groom wears a tuxedo and the bride wears a wonderful white wedding dress. 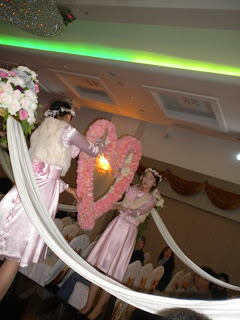 They walk down an aisle, they cut a cake, they toss a bouquet of flowers, they kiss, they are presented to the assembled masses, and they even taken hundreds if not thousands of pictures. Yet, given all of these things, there is still an entirely different feel to a Korean wedding then there is to a western wedding. The first thing that is different is the wedding hall. Here in Korea there are buildings where their only function is to serve as a wedding hall. They're not multipurpose halls, they are only wedding halls. Secondly the hall itself is just ridiculous. It feels like you are walking into a wedding themed prom. Take for instance when the Bride and Groom walk into the wedding. There are disco lights, music, and strobe lights. It feels like to truly enjoy the wedding you're supposed to be on a wild ecstasy trip. This doesn't even take into account the bubbles from the ceiling or the felt covered chairs. Another difference would be the required bows. This is quite impressive. In general bowing to someone is not exactly the most impressive of feats, but when your bow turns into a full on head on the floor bow it's impressive. Especially considering the fact that you're wearing a tux, now gentlemen who have worn a tux. Do you think you could pull that off. Take into account you have only a few seconds to go from full standing to complete submission bow and that you are wearing a tuxedo. Luckily for the women folk, they only have to pull a standing bow, but they still have to get themselves close to 60 degrees. Then there are the subtle differences. Take cutting the cake for example. It is done directly after the ceremony. The cake itself is even different, nobody gets to eat it but the bride and groom. It is also a very small cake placed on top of a plastic cake so that it looks like you're getting a huge cake. Another subtle difference is when they toss the bouquet. Here it's done right after the ceremony during the picture session. It is also only tossed to about three people who are friends. Single is not required, just being feminine is. Another subtle difference is when the bride and groom walk out of the ceremony. They proceed down the center aisle, but while they are doing this two "assistants" stand about ten feet behind them with trumpets. These trumpets however do not play music, they shoot out streamers, or confetti, or whatever you choice of celebratory object might be. It's like throwing rice, but coming out of a trumpet gun at a pretty good clip. The last difference that I'm going to talk about is the reception. It's really not a reception, but just a quick meal. There is no first dance, no garter belts, no speeches, no nothing really. It's a buffet style meal where you eat and then go. Alcohol is completely optional and it's only a meal. It's just a little weird, sometimes the bride and groom only show up for about three minutes to see people and then they leave. I guess I'm just used to the big party that is supposed to take place after the wedding. Alas, the wedding that I went to this weekend was quite fun. Mark and Ira looked wonderful, and meeting David's family was a little bit of a mind-trip. After the wedding we headed out to celebrate David's birthday. 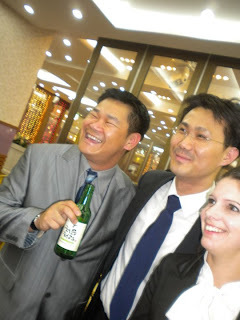 We were partying up in Ansan which is a city that none of us lived in, but it is where David's family is. We spent three hours at a norae bang, which included such norae bang favorites as: High and Dry by Radiohead, Say it Ain't So by Weezer, Bad Moon Rising by CCR, and tons of other songs. The 80's definitely made an appearance as did some relatively on-key singing by yours truly. However, once I leave this country, I think that my karaoke days will be left behind me. Nobody benefits when I sing, that is, unless you're looking for humor. The night ended as when we sauntered back to our motels/hotels to sleep off the fluids we imbibed. All in all it was a good wedding, and a good weekend. A Temple Close to Home.